Celebrate the fantastic birds in your area by offering them a home in the Heartwood Moss Green Lord of the Wing Bird House. This dramatic piece combines bold color with rustic style, for a remarkable addition to your avian sanctuary. Its extended, steeply pitched roof captures attention, furthered by the overlapping cypress shakes and copper ridges. The scored, wooden exterior of the home is reminiscent of tree bark, and a faux, light green door at the front completes the look. A 1.5" diameter entry hole rests on this door, enabling birds to enter the house. A cleanout hole on the back allows you to check the item seasonally, and a copper disc covers it. Ventilation slots beneath the significant roof regulate the internal temperature, keeping nestlings safe, and a drainage hole on the base helps the nest stay dry. The wide base offers plenty of room for an avian family, and the all-wood construction is made to withstand the elements. 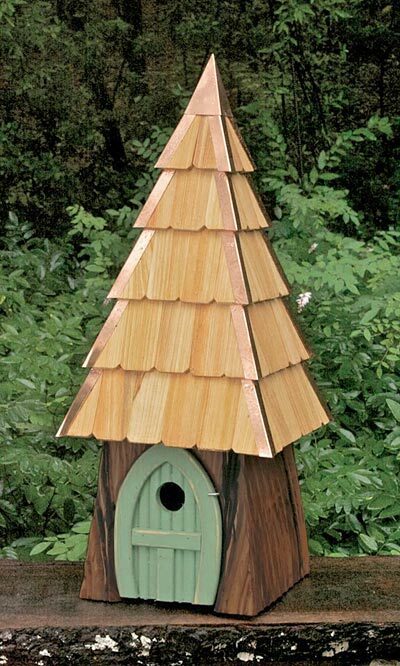 Use the included mounting plate to situate this house on a 4" x 4" post in your garden, enjoying the birds it attracts. Add a touch of the forest to your yard with this Moss Green Lord of the Wing Bird House. Made in the USA.